ਜਿਵੇ, (n = c / v). 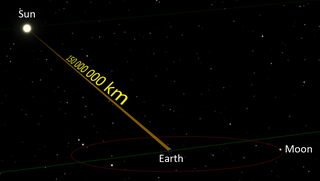 ਇਸਲਈ ਹਵਾ ਵਿੱਚ ਰੌਸ਼ਨੀ ਦੀ ਗਤੀ c ਨਾਲੋਂ ਲਗਭਗ 2,99,700 km/s ਜਾਂ 90 km/s ਘੱਟ ਹੈ।. ↑ Penrose, R (2004). The Road to Reality: A Complete Guide to the Laws of the Universe. Vintage Books. pp. 410–1. ISBN 978-0-679-77631-4. ... the most accurate standard for the metre is conveniently defined so that there are exactly 299,792,458 of them to the distance travelled by light in a standard second, giving a value for the metre that very accurately matches the now inadequately precise standard metre rule in Paris.